The Vimanmek Palace is a former royal palace in Bangkok, Thailand. It is also known as the Vimanmek Teak Mansion or Vimanmek Mansion. 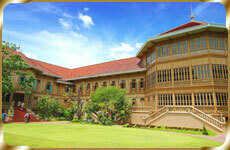 It is located in the Dusit Palace complex, nearby Dusit Zoo in Dusit district. Vimanmek Palace was built in 1900 by His Majesty King Rama V by having the Munthatu Rattanaroj Residence in Chuthathuj Rachathan at Ko Sichang, Chonburi, dismantled and reassembled in Dusit Garden. The celebration for the completion of Vimanmek Palace was held on March 27, 1901. Be taken back by the marvelous architecture and rich cultural heritage of Ayudhaya’s Bang Pa-In Palace. After paying homage and receiving a blessing at three of Ayudhaya most famous temple, sit back and relax as you enjoy a fantastic buffet lunch while cruising back to Bangkok. 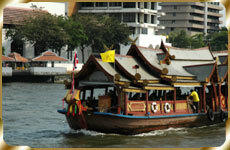 Enjoy the sights and sounds of life along the historic Chaopraya River from the luxury of Grand Pearl Cruise. Your Holiday won’t be complete until you’ve experienced Grand Pearl Cruises. Trip Starts by long tail speed boat. The trip passes various canals and temples you will get a good feeling of life on the waterway and see Thai people on work at home by the canals, then moves to rice barge boat. 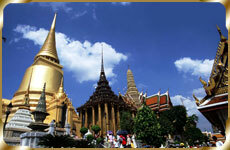 The most exciting, spectacular, and vibrant experience trip in all of Thailand. A Trip with no comparison and experience of a lifetime, as a dram come true.